The following pictures show some of the work we've been doing around our house this winter and spring. All photos were taken in late May 2000. If you'd like to see some more photos, this page has some photos from January 2000, this page has some photos from December 1999, and this page has some older shots from May 1999 before we moved in. All photographs on this page are Copyright © 2000, Chris Swingley, except those with me in them, taken by Jamie Barger. Each of the photographs are between 15 - 35 K, so the page will load slowly over a modem link. This spring we had more water from melting snow and rainfall than in past years and water and silt leaked into our inground water tank. This photo, and most of those that follow show me cleaning out the tank. 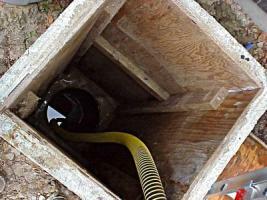 Our water tank has an access hatch 17 inches in diameter that is accessible through the 22 inch by 22 inch tunnel shown in the picture above. The top of the tank is about six and a half feet down from the ground. The first thing I did was rent a pump and pump all of the water out of the tank. About 6 inches of water remained in the very bottom of the tank when I was done. After the water was removed, I went down into the tank, and cleaned it with a bucket, mop and a dilute bleach solution. 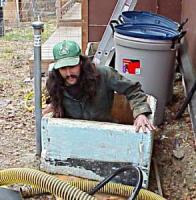 Here I'm descending into the tank using a half ladder I made. 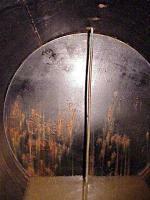 The tank itself is cylindrical, 54 inches in diameter and nine feet from end to end. Now I'm completely inside the tank looking at the end where our water pump draws water. The pipe running down the back leads to the pump. You can see how brown the water is from the silt that went into the tank during breakup. The back of the tank is a little rusted, but shows no signs of leaking. 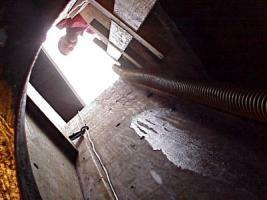 That's Jamie at the top of the tunnel leading to the tank, where I'm standing in the photograph. Not a job for someone who gets nervous in tight spaces!